HAND SINKS You Can Add a K-175 Electronic Faucet To Any Hand Sink - $1434      Hand Washing Sinks  A.d.A. uNiTS FOR ThE phySiCALLy ChALLENgEd Bowl Size: 16” x 14” x 5”. 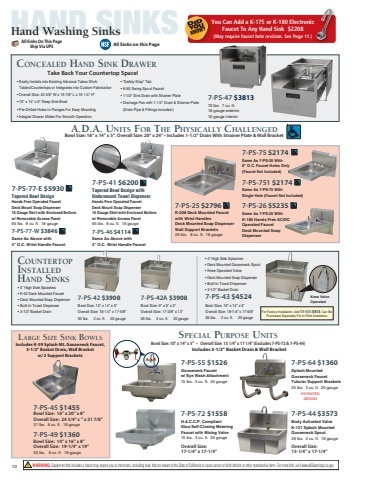 Overall Size: 20” x 24” Includes 1-1/2” Drain With Strainer Plate & Wall Bracket With 2 Side Support Brackets All Sinks On This Page Ship Via UPS  All Sinks on this Page 7-PS-25 $1980 K-208 Deck Mounted Faucet with Wrist Handles Deck Mounted Soap Dispenser 25 lbs. 8 cu. ft. 18 gauge 7-PS-26 $3706 K-180 Hands Free AC/DC Operated Faucet Deck Mounted Soap Dispenser 25 lbs. 8 cu. ft. 18 gauge 7-PS-75 $1538 8” O.C. Faucet Holes Faucet Not Included 25 lbs. 8 cu. ft. 18 gauge        COuNTERTOp iNSTALLEd hANd SiNkS      • 4” High Side Splashes • K-52 Deck Mounted Faucet • Deck Mounted Soap Dispenser • Built-In Towel Dispenser • 3-1/2” Basket Drain • 4” High Side Splashes • Deck Mounted Gooseneck Spout • Knee Operated Valve • Deck Mounted Soap Dispenser • Built-In Towel Dispenser • 3-1/2” Basket Drain 7-PS-43 $2938 Bowl Size: 10” x 14” x 5” Overall Size: 18-1/4” x 17-1/4” 36 lbs. 2 cu. ft. 20 gauge 7-PS-42 $2538 Bowl Size: 10” x 14” x 5” Overall Size: 18-1/4” x 17-1/4” 30 lbs. 2 cu. ft. 20 gauge 7-PS-42A $2538 Bowl Size: 9” x 9” x 5” Overall Size: 16” x 12” 26 lbs. 2 cu. ft. 20 gauge Knee Valve Operated  For Factory Installation, Add TA-503 $417. Can Be Purchased Separately For In-Field Installation SpECiAL puRpOSE uNiTS Bowl Size: 10” x 14” x 5” • Overall Size: 15 1/4” x 17 1/4” (Excludes 7-PS-72 & 7-PS-44)  LARgE SizE SiNk BOwLS Includes K-59 Splash Mt. Gooseneck Faucet, 3-1/2” Basket Drain, Wall Bracket w/ 2 Support Brackets 7-PS-45 $1030 Bowl Size: 16” x 20” x 8” Overall Size: 24 3/4" x ” x 21 7/8” 31 lbs. 8 cu. ft. 18 gauge 7-PS-49 $963 Bowl Size: 14” x 16” x 8” Overall Size: 19-1/4” x 19” 30 lbs. 8 cu. ft. 18 gauge   Includes 3-1/2” Basket Drain & Wall Bracket 7-PS-55 $1079 Gooseneck Faucet w/ Eye Wash Attachment 15 lbs. 3 cu. ft. 20 gauge 7-PS-72 $1102 H.A.C.C.P. Compliant Slow Self-Closing Metering Faucet with Mixing Valve 15 lbs. 3 cu. ft. 20 gauge Overall Size: 17-1/4” x 17-1/4” 7-PS-64 $963 Splash Mounted Gooseneck Faucet Tubular Support Brackets 25 lbs. 2 cu. ft. 20 gauge PATENTED DESIGN 7-PS-44 $2529 Body Activated Valve K-121 Splash Mounted Gooseneck Spout 28 lbs. 2 cu. ft. 18 gauge Overall Size: 15-1/4” x 17-1/4”        10 WARNING: Equipment that includes a faucet may expose you to chemicals, including lead, that are known to the State of California to cause cancer or birth defects or other reproductive harm. For more Info.,visit www.p65warnings.ca.gov. DID YOU KNOW?